He is a three-time Stanley Cup winner. He is an Olympic gold medallist and a four time Vezina trophy winner as the NHL's best goalie. Before all is said and done he will be the NHL's winning goalie and all-time shut out king. The Hall of Fame awaits him. And now Martin Brodeur is an author, too. 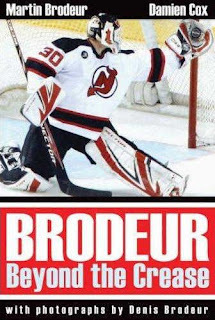 Brodeur released his autobiography in 2006, with a little help from top hockey writer Damien Cox. The book, called Brodeur: Beyond the Crease , was published by Wiley. In 2007 separate Canadian and American paper back editions were released. His autobiography is certainly premature. After all he has already put in great seasons after the book's release and he is showing no signs of slowing down just yet. But he offers a lot of insight and opinion on a wide range of topics and is worthy of a read. As the Beyond The Crease subtitle suggests, Brodeur had things to say, and this was his preferred way to communicate them. Don't forget back in 2006 the NHL was coming out of the lost lockout season, so there was plenty on his mind. He talks at length about many aspects of the business of the game, from the lock-out to agents to the salary cap to Lou Lamoreillo. The book even opens with a chapter entitled "A Company Man" where Brodeur explains his own contract he himself negotiated, a contract that was criticized by agents, the NHLPA and even some players as being too far below market value and therefore hurting players across the league. He goes on to thoroughly offer his insight of the game on and off the ice, never afraid to make suggestions to make the game better. He gives us an inside peek at the life of a professional athlete, as well as running through the mostly ups and few downs of his career from the New Jersey to the Olympics. He gives advice to kids, talks about players and other goaliesaround the league and gives his thoughts on the direction the sport needs to head next. But the book offers more than just hockey. In a very personal and likable fashion he openly talks about his cherished youth and his relationship with his father, an Olympic goalie-turned-hockey-photographer who is a bit of a hockey legend in his own right. He even weighs in on topics such as Quebec and Canada, life in America, and life as a celebrity. Two things are obvious in reading this easy page turner - Brodeur has a lot to say, and he's a really genuine and open guy. His passion for the important things in his life is so obvious you can almost see a twinkle in his eye as you read his words. All in all this easy-to-read book is solid though honestly not spectacular. Brodeur does not shovel a lot of dirt (although he does rip Patrick Roy pretty good), but he is very open about a wide variety of topics, ensuring even non-Brodeur fans something to take away from the book. I would recommend this to any hockey fan, even juvenile readers. For adults it may be more of a time-passing, light read on a long trip or sitting by the fire waiting for the game to start. Finished the book, amazing book chapters gave me it for 5$ cause they said they never heard of it :). best hockey book i have ever read.